The 24-year-old has already spent a decade playing guitar informed by the “colorful lushness” of bluesmen like Stevie Ray Vaughan. But Mayer’s own sound developed from hearing “bits of tones” from other musicians, he explained in a recent phone interview after a string of shows in Florida. “I started liking sounds on people’s records that only occurred once or twice,” Mayer said. His ear for singular good notes is evident in his playing. Unlike some of his role models, Mayer shuns blues “virtuosity” and extensive jam sessions; both live and in the studio, his solos are confident but economical. In fact, he says, on stage he consciously limits the solos — an exercise in discipline for someone so gifted. What Mayer focuses on instead is the craft of songwriting. His lyrical candor comes packaged in unique metaphors and imagery. A café’s salt and pepper shakers, the city’s lights and sirens, his lover’s toothbrush, a childhood lunchbox and a “quarter-life crisis” in his “still verdictless” existence are all subjects for Mayer’s pop musings. He writes and sings about universal themes — love, travel, coming of age — but without the usual clichés. Even traditional blues themes are addressed with an enduring optimism. His natural poetic observations of life suit Mayer’s eloquently sparse instrumentation. As another review coined it, Mayer’s “childlike lucidity” makes the everyday item noticeable, even worthy of marvel. Titles like “My Stupid Mouth,” “The Great Indoors” and “Love Song for No One” further hint at his inspired creative view. 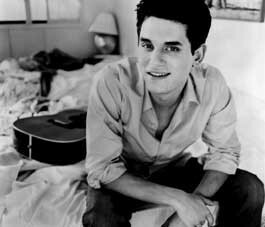 Room for Squares is an expansion upon Mayer’s deft performance on 1999’s self-released Inside Wants Out. The new release represents a transition from acoustic to electric, and to a major label. “It intoxicates you… you absolutely go bonkers!” he exclaimed about his reaction to being approached by industry heavies. But a November appearance on Conan O’Brien and inclusion on Rolling Stone’s latest “Next Wave: 10 Artists to Watch” list have not distracted Mayer from his focus. All signs suggest this young stargazer has his feet on the ground, despite so much national attention. That instinct finds a balance between the rootsy and the cosmopolitan — a mixture that has broad appeal outside the margins of blues, and across the usual divide of college and adult-oriented radio. Sounds like a good match for Burlington.